It refers to the act of swallowing. It consists of oral, pharyngeal and oesophageal stages. The first stage is voluntary, second and third stages are involuntary and reflex in nature. It is voluntary. The food is masticated by mixing with the saliva. The solid food is converted into a soft bolus and positioned on the dorsum of the tongue to be pushed to the oropharynx. In the oral stage, the bolus passes through the oral cavity towards the pharynx, assisted by the tongue pressing against the hard palate. Pharyngeal stage The presence of food at the entry of pharynx stimulates the receptors in the fauces of tonsil, and epiglottis which initiate the reflex. This stage is involuntary. The afferent and efferent impulses are carried by V, IX , X and XII cranial nerves. The center is the swallowing center, situated in the medulla and lower pons. The second stage of swallowing is important, as the reflex mechanisms allow the bolus to enter the esophagus and not the other openings. The exit of bolus from the mouth is prevented by its closure and the tongue pressing against the hard palate, creating high resistance. The entry of bolus into the nasopharynx is prevented by the soft palate raising and pressing against the posterior pharyngeal wall. The entry of bolus into the trachea is avoided by the upward and forward movement of larynx, which causes the glottis approximating with epiglottis. This seals entry into the larynx. The vocal cords also approximate, inhibiting speech. Respiration stops during this phase of swallowing. With the reflex mechanisms preventing entry into these openings, the bolus is directed to enter esophagus through the pharynx. The bolus enters the esophagus from pharynx through the upper esophageal sphincter and the entry into the stomach occurs through the lower esophageal sphincter. The upper esophageal sphincter is supplied by the vagus and the distention of the sphincter, causes the inhibition of vagus and relaxation of sphincter. The distention of upper esophageal sphincter initiates a wave of peristalsis, which spread along the length of esophagus, pushing the bolus forwards. These are the primary peristaltic waves, traveling at the speed of 3 to 4 cm/sec. 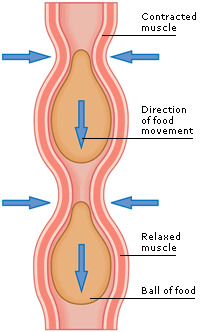 The force of gravity helps in faster rate of movement of bolus. Liquids travel faster than solids to reach the stomach. When the bolus reaches the lower esophageal sphincter (cardiac sphincter), it relaxes and allows the bolus to enter the stomach. After allowing the food entry into the stomach, the lower esophageal sphincter closes and prevents regurgitation of food into the esophagus. The lower esophageal sphincter is regulated by noncholinergic and nonadrenergic nerve endings coming from the intrinsic myenteric plexus. The transmitter that is released here is VIP or NO. Lower esophageal sphincter(LES) contracts by acetylcholine released from vagal endings and relaxes by VIP and NO. If the primary peristalsis does not completely empty the esophagus, then one or more secondary peristalsis arises from the distal part of esophagus, due to distention and empty the food from esophagus.